Today my lecture’s kick-off on ‚Strategic Management‘. 10 students from all over the world. Tennessee, Chile, Turkey, Hong Kong. Interested – hopefully – in manus agere, translating a company from vision to action. A lot of buzz words, strange names of strategies like 36 chinese strategems, guerilla strategy, distruction strategy, long tail, first mover, fast follower, core competencies to become Nr. 1. Pleasure guaranteed over 50 hours lecture. And of course less important 5 credits. 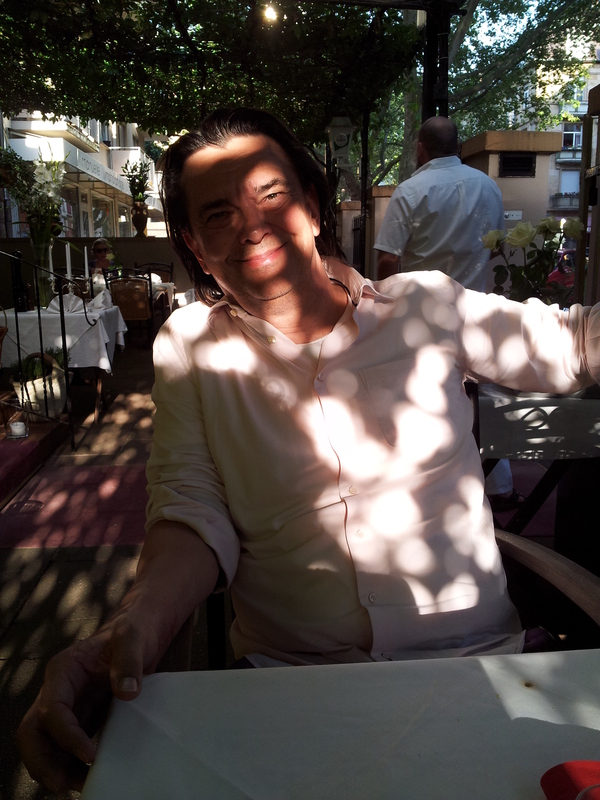 Lecture on Strategic Management in springtime 2013 – to whom it may concern. Managing disruptive innovations. A groundbreaking new approach by Clayton M. Christensen to be sucessful as a head e.g. of any high tech company. 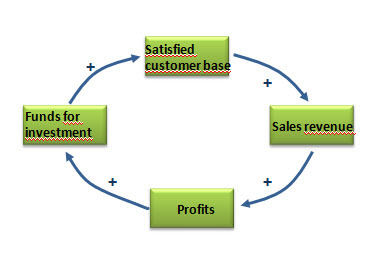 Chandler´s sucess formula to change a company in the long term. Always obey his law: Structure follows strategy and technology follows structure. Most companies don´t know Chandler and fail to implement strategies sucessfully. Hofstede´s cultural dimensions. A comparison oft two different cultures. How to overcome obstacles in daily business in an international company. 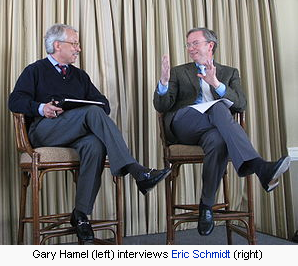 Hamel and Prahalad´s revolutionary concept on Core Competencies´. Something that changed the world since the 90s significantly. Write your paper in a scientific way: http://en.wikipedia.org/wiki/Scientific_writing . If you do have any questions, please feel free to ask. If you like, send me your messages via Skype. P.S. : I hope you´ll get home safe and never forget your studies in Germany. Brian Martindale from Tennessee and other students from all over the world shot a very professional video on their study 2011/ 12 at the „Cooperative University Baden-Württemberg Mannheim“. Some of them participated in my lecture on ´Strategic Management´. Very good students. A touching time also for me. Welcome to the winter term. Today around 50 students from all over the world (Turkey, China, Finnland, Tennessee, Poland, Spain, Chile for example) participated in our kick-off meeting at the International Office at the Baden-Württemberg Cooperative State University. Carsten Münch head of the International Office in his opening speech. Said and the other students listening to him carefully. My job is to hold the lecture on ´Strategic Management´. 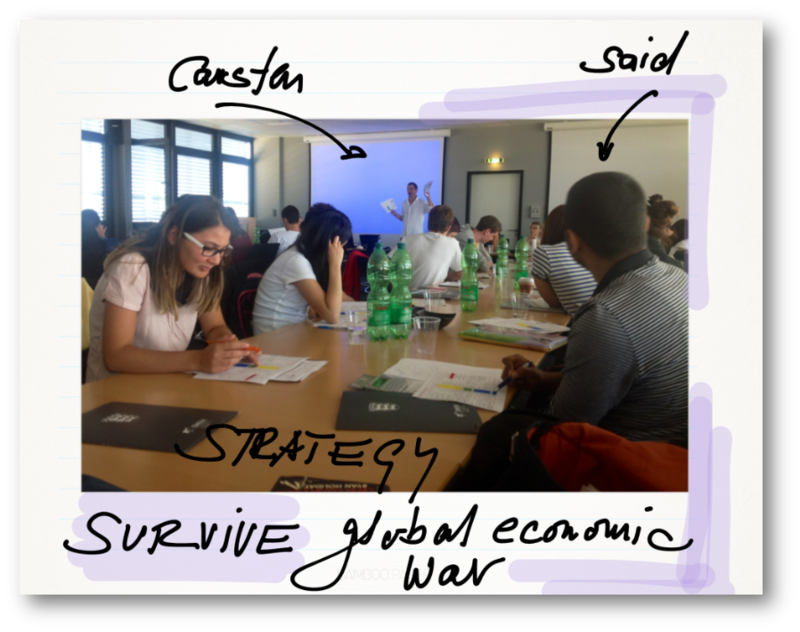 Heading – Strategy = Survival in Global Economic War. At 13 September we´ll start. Welcome to my springtime lecture on ´Strategic Management´. During the next weeks we’ll start talking about the way to manage a company on the long term. Is this possible over a period of four or more years? Although weather couldn´t be precisely forecasted with the help of supercomputers for more than two weeks. Well, does it make any sense at all ? Which tools may be of any interest to managers and of course to you? Is this strategy business an important trend? Maybe a downtrend? Is it important for my personal career? Are there any recipes for success? Is strategic management only a matter of top management´s interest? Or should everyone in a company understand it? My short CV: My name is Hartwig Maly. Maly is my family name. It´s of polish origin and means little. Hartwig is a very old german name. Long ago, it was someone carrying a javelin. And it´s my first name. For our chinese friends it might be confusing, that european names never started with the family name. I was born in 1952. I studied chemistry and physics and made my PhD in ´Quantum Mechanical Calcuations of Molecular Vibrations`in 1984. In this area strategy is of no interest. Physicists aren´t quite sure whether time exists at all. Thereafter I worked for a big international pharmaceutical company in different management functions. Main focus on IT, strategy, research and consulting. Since 2001 I work for my own as management trainer and career coach. General remarks: To manage (lat. manus agere = to take something by hand), means taking and changing a company according to the company´s objectives. Objectives are your targets as a manager of your company. The end of your company´s journey. That doesn´t sound very easy? And of course it isn´t. Managing a company e.g. with 1.000 employees to achieve a target, is a challenging job. 1.000 different ideas – or more – to live and work and 1.000 different options for you as a manager to motivate or frustrate your employees. If you intend to do your business strategically, it either means to plan and to manage over a longer period of time, at least three years, or to plan and manage significant changes/ innovations like the bringing of products like iPhone or iPad onto the market. The picture on the left shows a company´s road from the current situation in 2012 to the future in 2020. Every possible way is called a strategy. Of course, there are a lot of different ways respectively strategies. But we are only interested in one of them, called the dominating strategy. It´s not always the shortest way. Because there are a lot of obstacles in our road map affecting our strategy. Strong competitors, powerful trends, innovations, unpredictable events like ´Taleb´s black swans´. It´s of course not possible to forecast anything over a longer period of, for instance, some weeks in detail. Although we know this, we as managers or consultants wish to develop and use strategy-tools for an approximate job. You will learn: In our lecture you will learn to understand basic concepts in the area of strategy and use strategy tools to solve contemporary company´s problems. Is it possible to „stuck in the middle“ of two generic Porter strategies, cost leadership and quality leadership. Michael Porter wrote his famous books about „Competitive Strategy“ in 1980 and „Competitive Advantage“ in 1985. He argued, that it wouldn’t be possible to „stuck in the middle“ of both strategies. That means, that it would not be possible to succeed with a strategy-mix, to be cost leader as well as quality leader. Please explain the essence of Porter’s „Competitive Strategy“ approach. Unfortunately in 1985, it was obvious, that Michael Porter was wrong with his strategy mix opinion. It was the beginning of success stories like Walmart’s. Explain the reasons for this failure. Nevertheless his competition strategy was the beginning of a very big, well payed career. In 2003 Michael Porter earned 125.000 pound for a lecture on his strategy theory at London School of Economics. The s-curve derives from an assumption that new products are likely to have „product life“. i.e. a start-up phase, a rapid increase in revenue and eventual decline. In fact the great majority of innovations never get off the bottom of the curve, and never produce normal returns. Innovative companies will typically be working on new innovations that will eventually replace older ones. Successive s-curves will come along to replace older ones and continue to drive growth upwards. In the figure above the first curve shows a current technology. The second shows an emerging technology that current ly yields lower growth but will eventually overtake current technology and lead to even greater levels of growth. The length of life will depend on many factors. Please explain the constraints, under which the S-curve works and whether there are scaled x-axis, representative for industrial segments like automobil, pharmacy, electronic components to predict the growth of innovation. Is there a preferred point on the curve for current technologies with the best cost/ benefit ratio to move to the emerging technology? 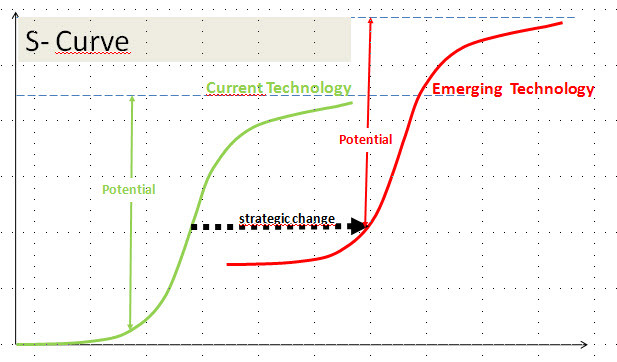 Does it make any sense to use the S-curve for strategic planning? Core competencies and success: In September 1983, Motorola made history when they approved the world’s first and only commercial cellular device. They had core competencies in the area of video-compression, battery- and flat screen technology. Unfortunately they did not succeed to apply their intellectual leadership (= core competencies) e. g. to develop new products for new markets. Igor Ansoff would have called this strategic new-product/ new-market-approach, diversification. 1998, Motorola was overtaken by Nokia as the world’s biggest seller of mobile phone handsets. Try to do a better job. Please explain the intellectual leadership approach for a nanotech company trying to diversify in cooperation with a diagnostics company like Roche Diagnostics. Are there any opportunities for our nanotech company to persuade Roche. Which revolutionary technologies could our nanotech company develop? 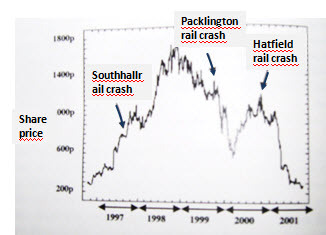 Find the right sensitivity analysis to describe the changes of share price of British Rail. Does this loop and the graph below describing Railtrack‘s share price over five years fit together? Which item might be missing in the loop to explain the development of the shares in a correct manner?